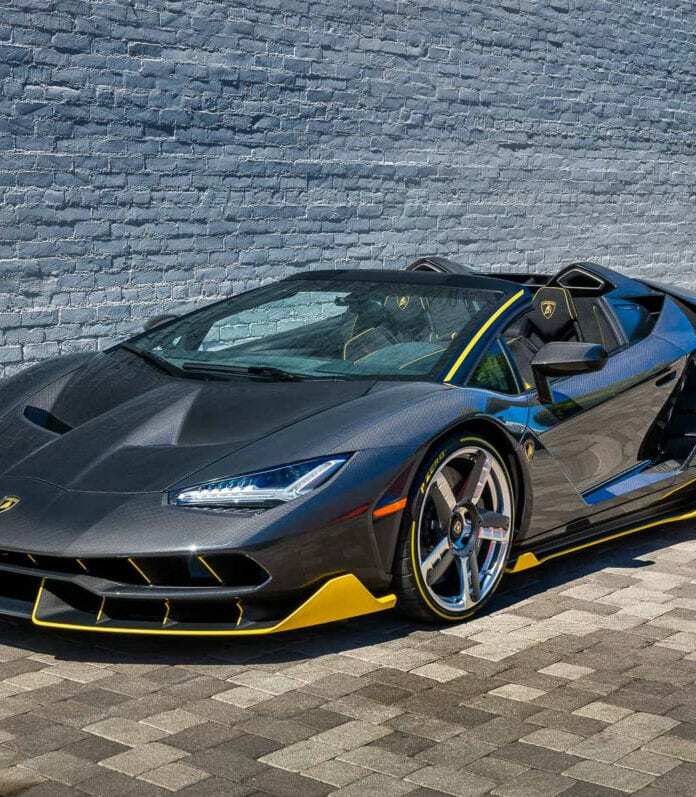 The world's first Lamborghini Centenario Roadster has been delivered in Beverly Hills, California. The world’s first Lamborghini Centenario Roadster has been delivered in Beverly Hills, California. Now that deliveries of the Centenario coupe have commenced, Lamborghini is rolling out the drop-top version of its new 759-hp supercar. The world’s first Lamborghini Centenario Roadster has been delivered in Beverly Hills, California. Completely custom built, the first Roadster dons a carbon fiber exterior with yellow accents as well as silver wheels with black brake calipers. Matching the exterior, the cabin features black Nero Ade leather and Alcantara upholstery decorated with yellow stitching. Lamborghini allows customers to personalize their Centenario top to bottom, from the colors and wheels to the interior materials and stitching. Delivering the very first copy of the Centenario Roadster to California makes sense, considering the vehicle made its first public appearance at Monterey Car Week last year. The model receives the same 6.2-liter V-12 engine as the coupe, producing 759 hp and 508 lb-ft of torque. Reaching 62 mph from a standstill requires just 2.9 seconds, according to Lamborghini, making it 0.1-second slower than the closed-top version. Top speed is more than 217 mph. The limited-edition Lamborghini Centenario celebrates the 100th anniversary of company founder Ferruccio Lamborghini’s birth. All 20 coupes and 20 roadsters were spoken for long ago. The coupes sold for a cool 1.75 million euros (roughly $2 million), while the roadsters commanded an even higher price of 2 million euros ($2.2 million).